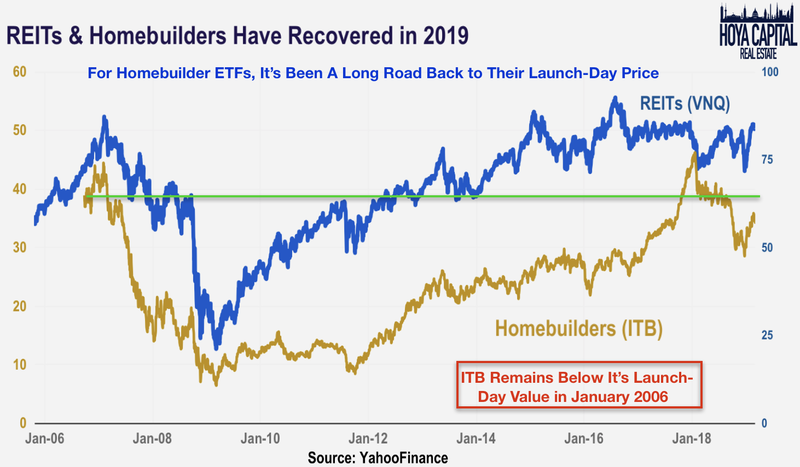 After their worst year since the financial crisis, homebuilders were left for dead in late 2018. The sector has roared back to life in 2019, powered by receding mortgage rates. Perhaps an echo of 2013, rising rates significantly slowed the single family markets to near-zero growth in 2018. Housing data - starts, sales, and prices - all softened considerably late last year. The homeownership rate climbed to a four-year high in the fourth quarter of 2018 despite continued affordability challenges. Demographics in the 2020s are highly favorable for continued household formation growth. The ten largest homebuilders accounted for a quarter of all home construction in the US in 2018. Homebuilding economics remain brutally challenging for all but the most operationally efficient builders. By most metrics, the overall US housing markets remain significantly undersupplied, an imbalance that further widened in 2018. Supply growth is the most effective antidote for rising housing costs. In our Real Estate Rankings series, we analyze each of the commercial and residential real estate sectors. 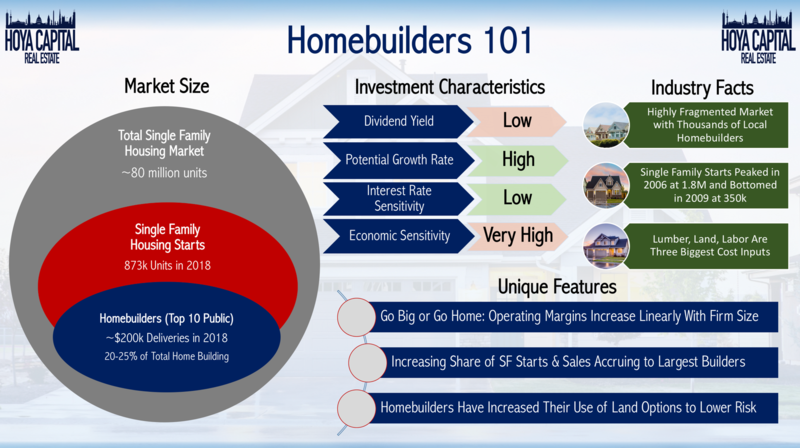 We analyze homebuilders based on both common and unique valuation metrics, presenting investors with numerous options that fit their own investing style and risk/return objectives. We update these reports every quarter with new developments. The homebuilding sector (ITB and XHB) is a highly competitive and fragmented industry. The top ten largest builders account for roughly a quarter of the total new home sales, but this concentration has intensified since the recession. 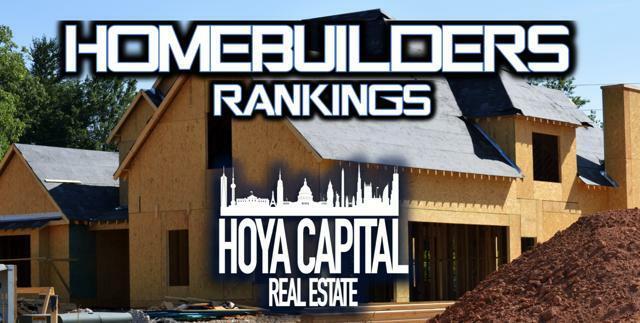 In our Hoya Capital Homebuilder Index, we track the ten largest homebuilders, which account for roughly $60 billion in market value: D.R. 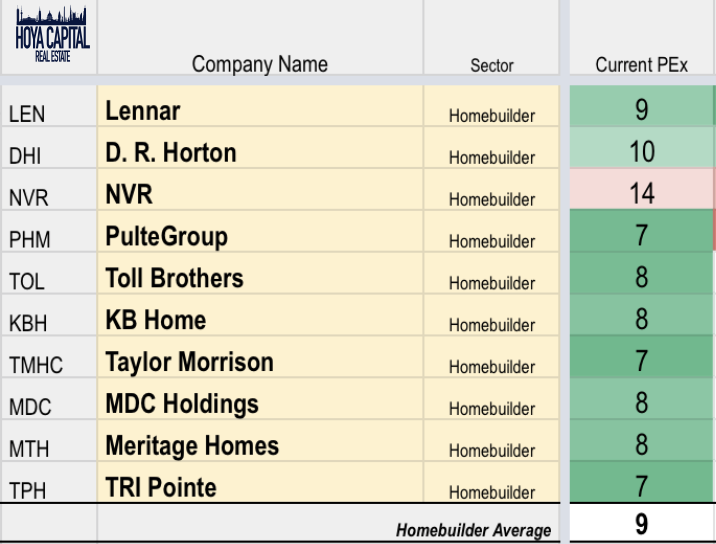 Horton (DHI), Lennar (LEN), PulteGroup (PHM), NVR (NVR), Toll Brothers (TOL), KB Home (KBH), Meritage (MTH), M.D.C. Holdings (MDC), Taylor Morrison (TMHC), and TRI Pointe Group (TPH). Homebuilding segments can be roughly split into four categories: entry-level, move-up, luxury, and retirement. As construction and regulatory costs have risen, homebuilders have shifted their focus towards higher-end units which command high enough margins to offset these increased costs. There has been renewed investment over the last year on the entry-level segment amid concern over the impact of tax reform on the upper-tier segments. 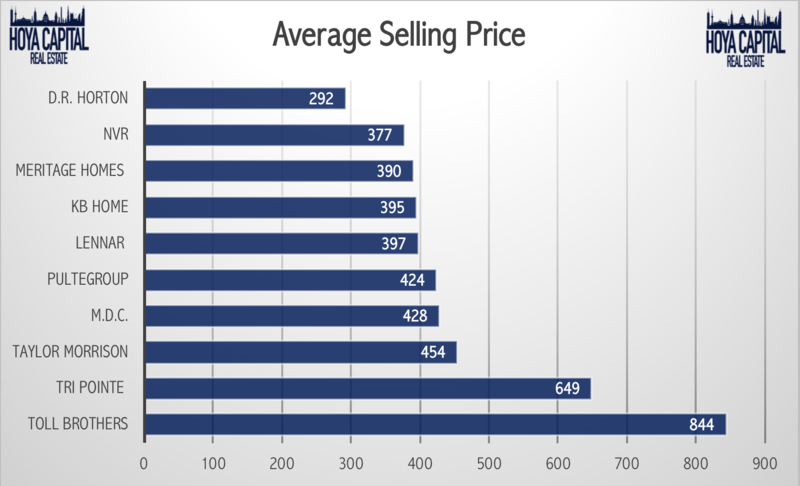 According to the Census Bureau, the median new home price was $377,000 in December 2018 which was 6% lower than January 2018. As shown, these ten builders are skewed towards the higher-end segments of the new home markets. Homebuilding is really two distinct businesses, each with different risk/return characteristics: 1) Land Development; and 2) Home Construction. Historically, homebuilders have been overweight in the land development business, holding hundreds of millions of dollars worth of unused land on their balance sheet and going through the multi-year permitting to get the land ready for single family development. Large builders have increased their use of land options since the financial crisis, which reduces risk and increases return on equity, but comes at the expense of slightly lower margins. 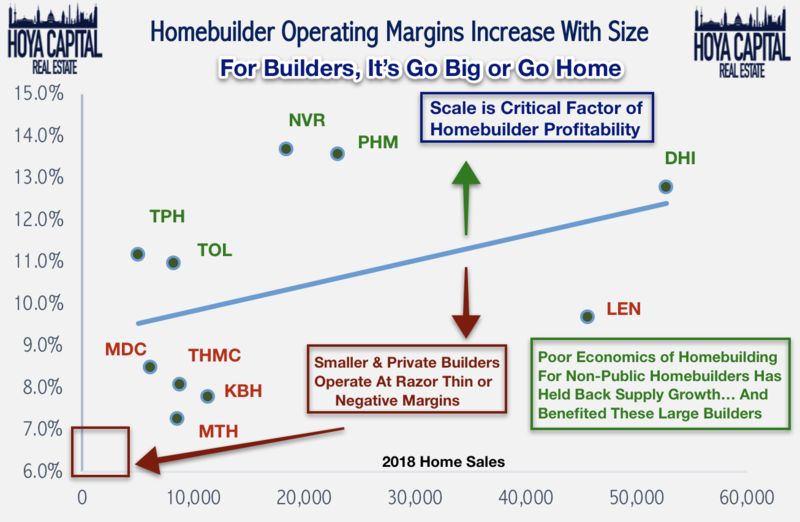 As we'll discuss throughout this report, size and scale have become critical factors in the homebuilding business as operating margins average 10% or less for typical builders. By nearly every metric, single-family housing markets remain significantly undersupplied. Household formations outpaced new housing starts by more than 100k in 2018 as the vacancy rate for both owner-occupied and renter-occupied homes reached multi-decade lows in the fourth quarter. The United States has been under-building homes since the early 1990s, and that trend of underbuilding has intensified dramatically since the housing bubble burst in 2008. 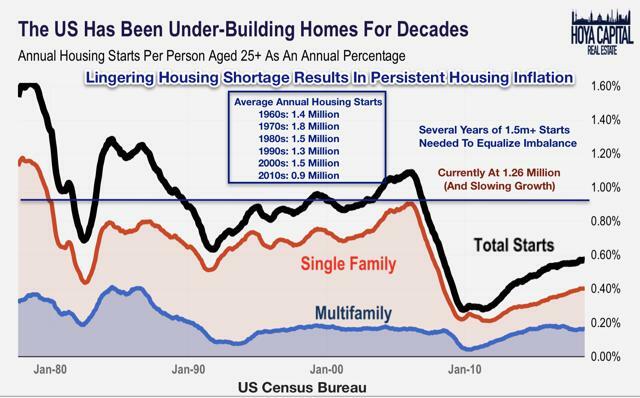 A shortage primarily rooted in sub-optimal public policy at the local, regional, and national levels, the US is building homes at a rate that is less than 50% of the post-1960 average after adjusting for population growth. Housing demand and household formation have historically exhibited a strong correlation with economic growth, which has inflected favorably in 2018. The US economy has added more than 20 million jobs since the depths of 2009 and in 2018, wage growth exceeded 3.0% for the first time since the recession. Even more importantly, demographics suggest a significant increase in demand for single-family housing, based on historical trends of homeownership preference. 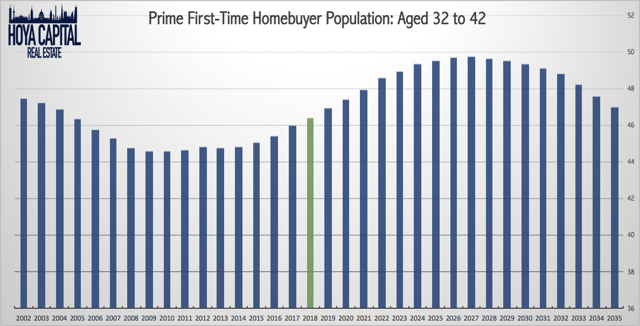 The average age of a first-time home buyer is 32-42 years old, a cohort that will grow by more than 1.5% per year through 2025. A significant factor in this sustained undersupply has been the downright dismal economics of new home construction for all but the most operationally-efficient homebuilders. Homebuilding operating margins average barely 10% for the largest builders and decrease to under 5% for the typical small private builder. For that reason, size and scale have become a critical competitive advantage for large homebuilders. 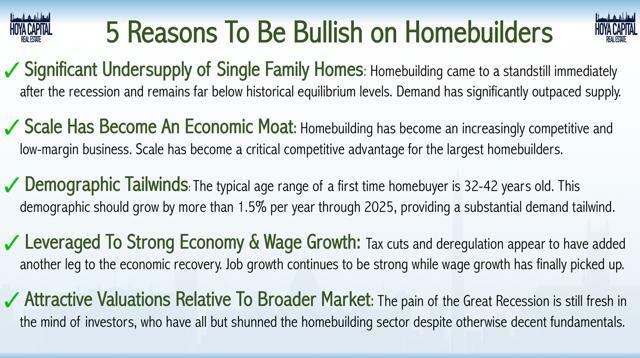 Below we discuss the five reasons that investors are bullish on homebuilders. 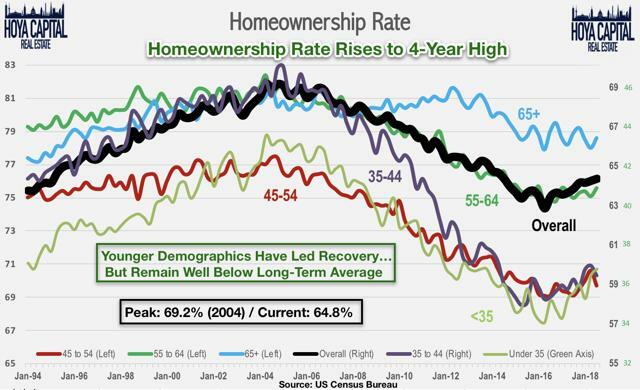 However, while favorable demographics and the strong economic backdrop seem to forecast robust demand for single-family homes, survey data and homeownership data indicate that it may not be so easy to pull younger households back into the ownership market. The combination of unaffordability and negative attitudes towards homeownership are key constraints that are unlikely to abate in the near term. A recent Freddie Mac survey noted several key trends that are helping to support rental demand including an increase in renter satisfaction to near-record levels and an increasingly favorable view towards renting as the most affordable housing option. 78% of tenants believe that renting is more affordable than owning, up significantly this past year. Despite that, the homeownership rate rose to a 4-year high in the fourth quarter of 2018, but the rate among the younger demographics remains well below the longer-term average. 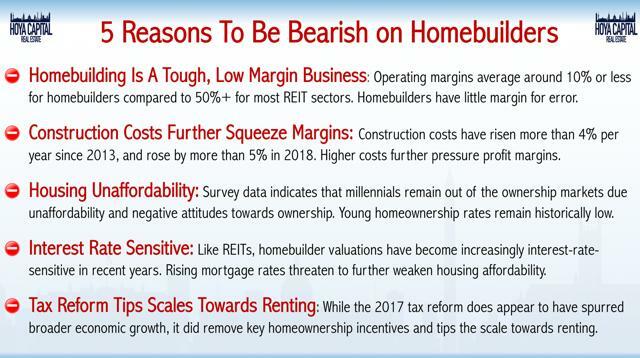 Rapidly rising construction costs have further pressured the already razor-thin operating margins for homebuilders. Even as there may be a significant shortage of housing as a whole, regulatory constraints and high land costs prevent new single family homes from being priced competitively for all but the higher-income earners. The 2017 tax reform also removed key tax code incentives to homeownership by capping the state and local tax deductions and raising the standard deduction. These changes have led to significant softness in the high-tax and high-cost coastal markets in particular. Further, whether fundamentally justified or not, homebuilder valuations have become increasingly more interest rate-sensitive in recent years. 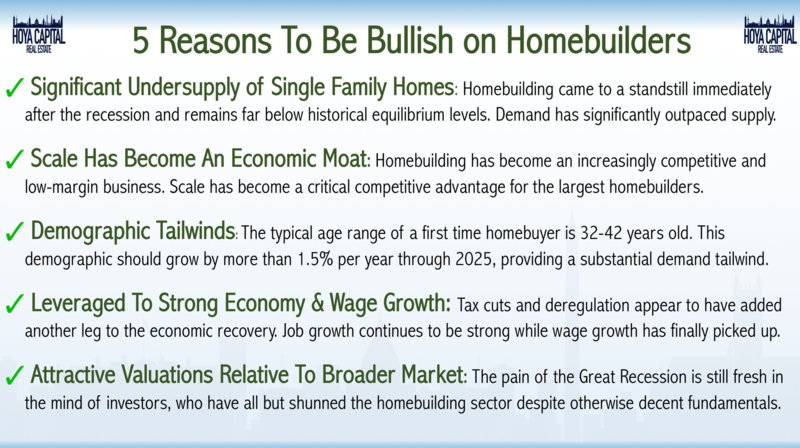 Below we outline the five primary reasons that investors are bearish on homebuilders. 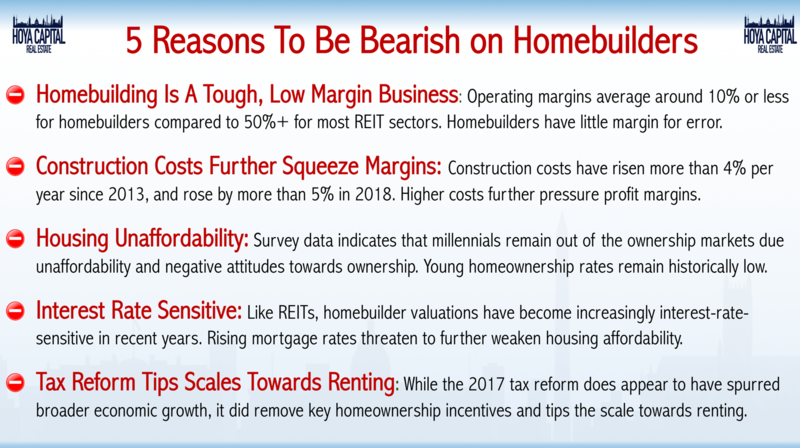 Way back in late 2017, homebuilders were the darlings of Wall Street analysts, a consensus view that we challenged in several reports including Homebuilders Surge Despite Housing Unaffordability. We noted that, while mortgage rates remained relatively low at the time, that an uptick in rates had the potential to derail the recovery as potential first-time buyers were already effectively "tapped out" with record levels of student debt, among other headwinds to first-time buyer demand. 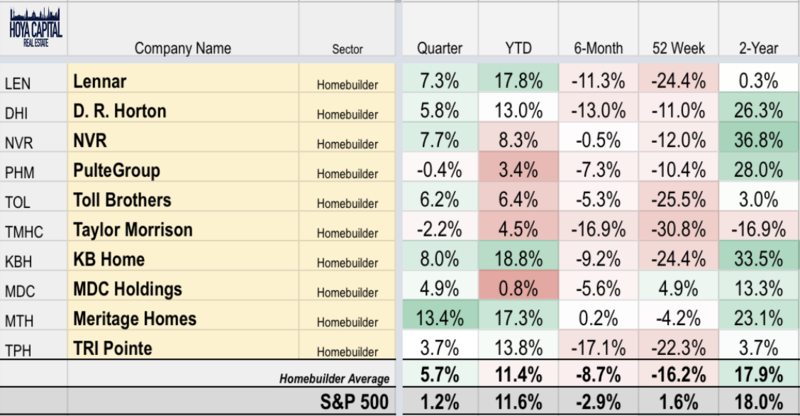 Our call was looking pretty dim as homebuilders rallied another 20% over the next three months, only to give that all back and then some, diving more than 35% from January 2018 through December 2018. We turned positive on the homebuilding sector in our November 2018 report, Homebuilders: Relief in Sight. Again, the call was looking pretty dim as the sector dipped another 10% in the following month, only to bounce back nearly 20% after bottoming in December. We remain positive on the sector in 2019 give the recent trends that we identify in the housing data section below. 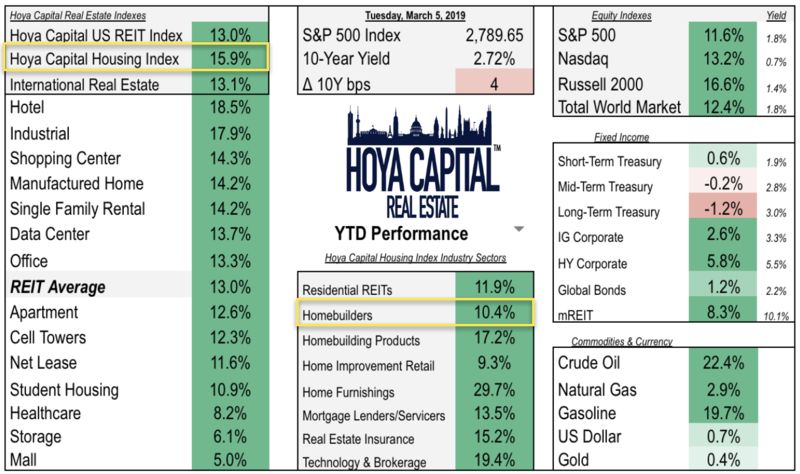 Despite their strong performance in 2019, homebuilders have actually lagged the broader housing sector, as measured by the Hoya Capital Housing Index, which has jumped more than 15% so far this year. With pockets of significance emerging in local markets, we are seeing a more significant divergence in performance between the individual builders. KB Homes, Lennar, and Meritage have been the best-performing homebuilders so far this year. M.D.C. and Pulte Group have been the laggards. Over the last two years, the homebuilding sector has roughly matched the performance of the S&P 500. It's no secret that the US single family housing markets softened considerably throughout 2018, though it shouldn't be all that surprising, or particularly concerning. Back in 2013, in the wake of the infamous "taper tantrum," the 30-year mortgage rate shot higher by 120 basis points between May and August 2013. At that time, new home sales were growing at an impressive 20% growth rate but just months later, that impressive growth was all but erased as 2014 ended with just a 2% rise in new home sales. After topping out in mid-2013, interest rates eventually receded, and housing data - starts, sales, and prices - all bounced back robustly. By 2015, new home sales were back to 15% year-over-year growth. Based on recent forward-looking data points, it seems that we may be set up for a repeat of this pattern. 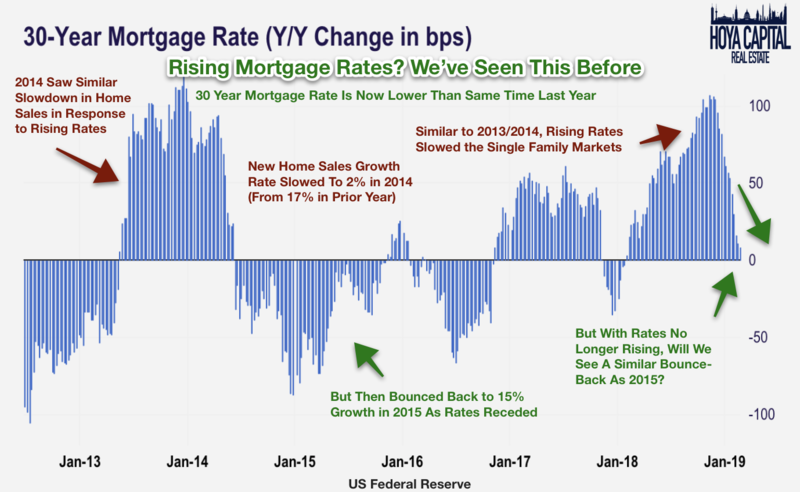 Mortgage rates rose by a nearly identical 120 basis points between September 2017 and November 2018, leading to a similar slowdown in home sales as the one seen in 2014. 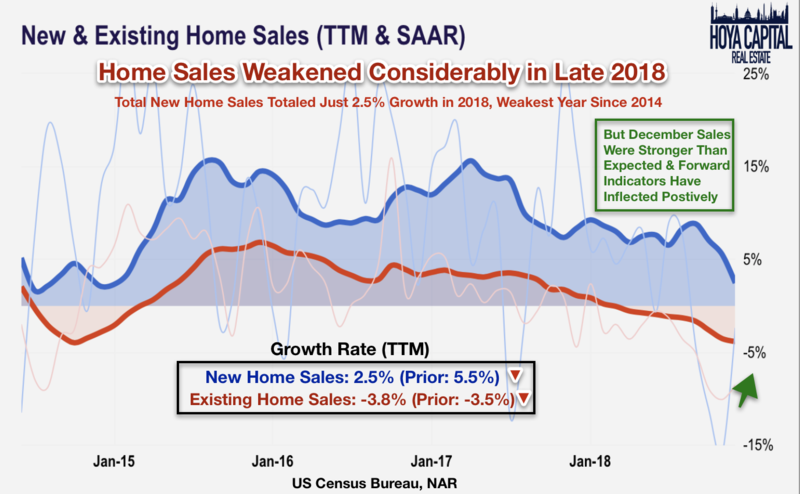 New home sales grew by just 2.5% in 2018 while existing home sales dipped by roughly 4% with the weakness intensifying in the second half of the year. Starts and permitting data showed a similar pattern of weakening in 2018. The long-delayed housing starts data for the month of December was released last week, and it wasn't pretty. Total housing starts ticked lower to just 3.5% growth on a trailing twelve-month basis, slowing from the 4.0% rate last month. Single family starts weakened throughout 2018 and finished the year at roughly 870k starts, higher by just 2.8% over the prior year. The 30-year mortgage rate, however, is now lower on a year-over-year basis, setting up a potential recovery by mid-2019. Forward-looking indicators have inflected higher over the last two months and commentary from homebuilders and other housing companies has suggested that the single family markets may be coming back to life. 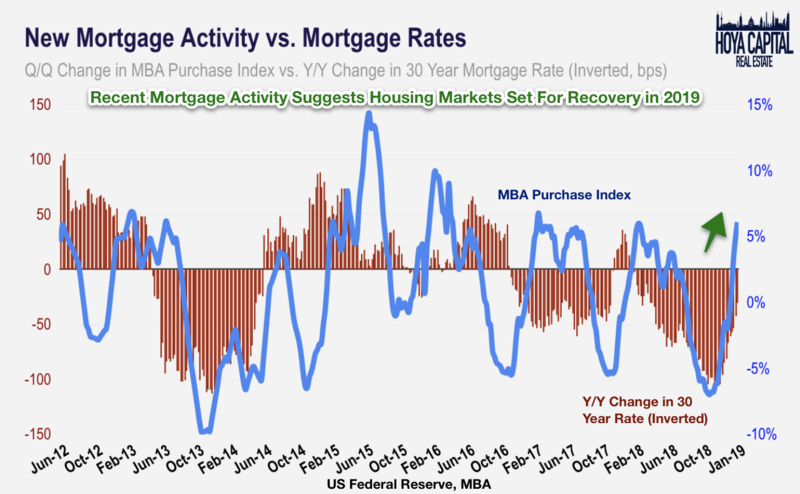 The MBA Purchase Index, a useful leading indicator of new and existing home sales, earlier this month jumped to the highest level since 2010 while the MBA Refinance Index rose to the highest level since last spring. If nothing else, the last twelve months have reconfirmed that mortgage rates matter quite a bit to incremental single-family housing demand, a theme that we've been discussing since mortgage rates initially jumped in the wake of tax reform early last year. 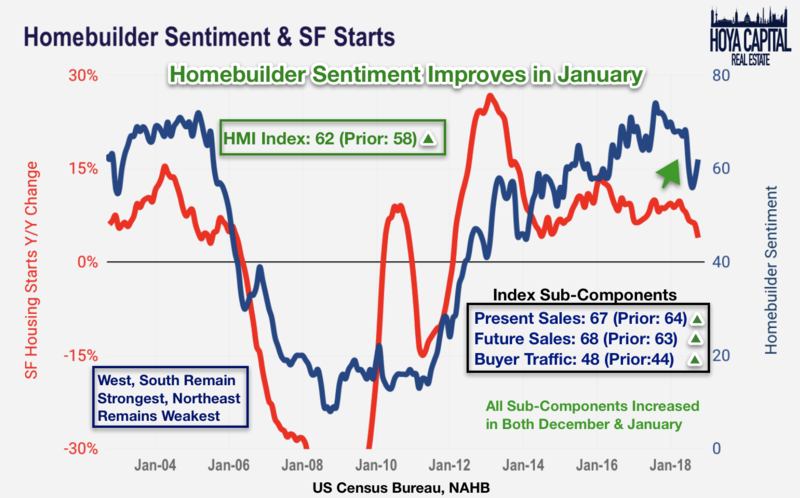 As rates have pulled back, homebuilder sentiment has improved, climbing for the second straight month in January after dipping to the lowest level since 2015 last November. All three sub-components of the Housing Market Index ticked higher for the month. It's safe to say that until this recent earnings season, there hadn't been a more closely-watched quarter for homebuilders since the end of the financial crisis. Homebuilders delivered results that were all across the map in their recent quarter. 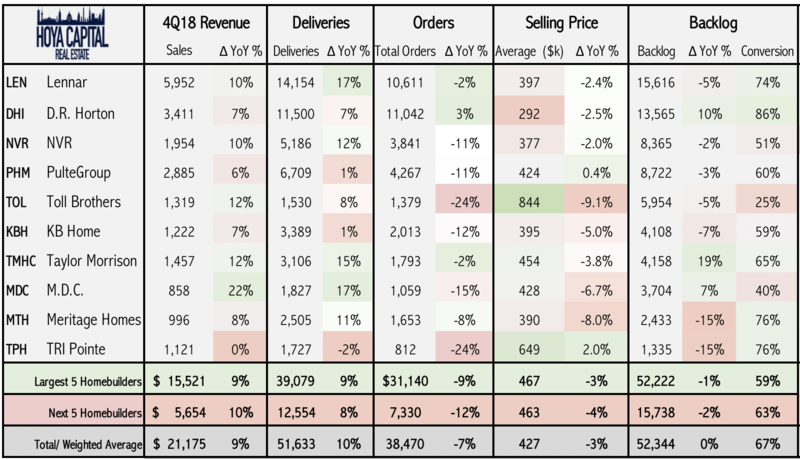 Homebuilding revenues and total home deliveries rose roughly 10% across the sector in the fourth quarter, a rather impressive feat considering the near-zero growth in new home sales at the national level. Net orders, the more closely watched forward-looking results, painted a darker picture. 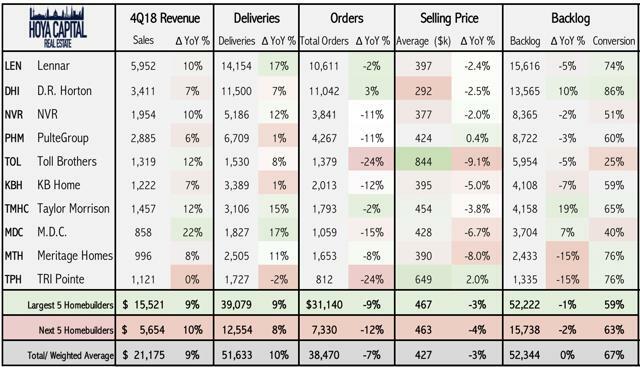 Orders dipped 7% year-over-year with sharp 20%+ declines reported by both Toll Brothers and Tri Pointe. The total backlog remained roughly flat after seeing impressive growth over the past three years. At $427K, the average selling price for new homes from these ten homebuilders was down 3% from last year, continuing a slowdown from the first quarter's rate of 5% and the peak of more than 12% in 2014. 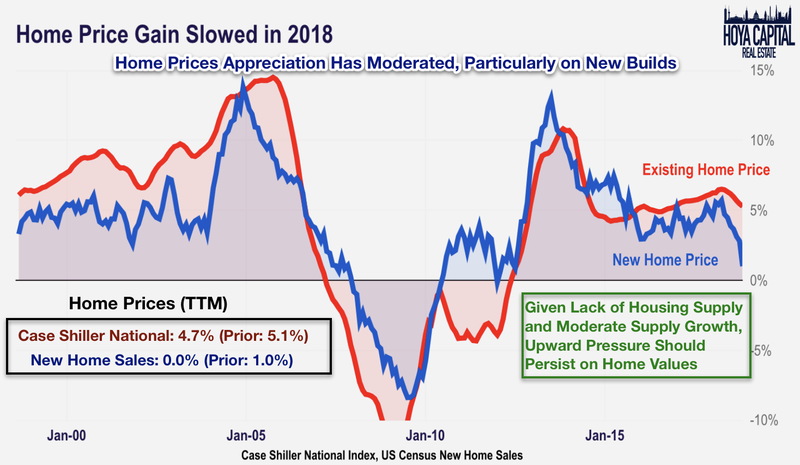 This rate of home price appreciation continues to lag the 4-5% rate of appreciation for existing homes as the "new home premium" has shrunk in since 2015. Rising values on existing homes, along with cheap financing from low mortgage rates, have been critical in allowing these builders to remain competitive and offset rising construction costs. This time is different, really. Home price gains in the pre-bubble period occurred despite modest rises in construction and replacement costs. In one of our favorite charts below, we chart home price appreciation against the US Census Bureau's construction cost index for single-family homes. We see that from 1999 through 2006, home price appreciation more than doubled the rate of construction cost inflation, producing an unstable environment whereby homes were priced far above replacement costs. Since 2007, construction cost inflation has more than doubled the rate of home price appreciation. 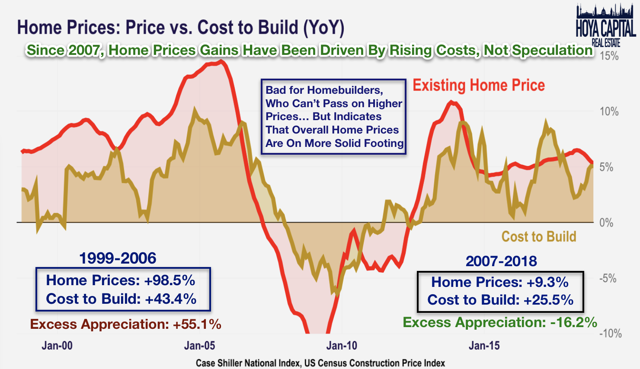 While a negative for homebuilders, who have less wiggle room to pass on rising costs to buyers, it does indicate that overall home prices are on more solid footing than they were in the "bubble" period. The "Four L's" of homebuilding bedeviled homebuilders in 2018: lumber, labor, lending, and land. The combination of a reacceleration in economic growth, trade disputes, and immigration policy pushed construction costs higher by more than 6% compared with last year. While land prices and labor costs continue to rise above the rate of inflation, two of the four constraints - lending and lumber - have eased considerably over the last two quarters. 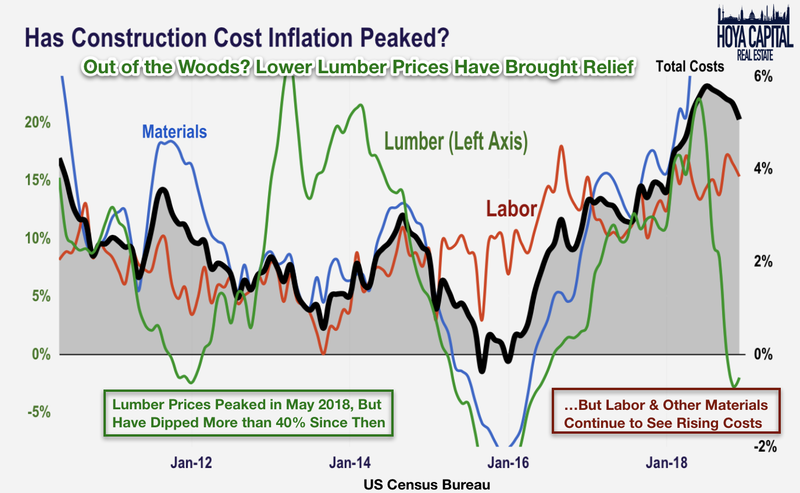 Lumber prices plunged more than 40% since peaking in May 2018 while mortgage rates have receded as discussed above. Labor costs, however, continue to tick higher as tighter immigration policies may put further pressure on the lingering worker shortage. Even before this recent surge in construction prices, homebuilding was a tough, capital-intensive business where size and scale are critical determinants of operating performance. Illustrating the operating leverage inherent in the homebuilding business, operating margins have improved steadily over the last several years as home sales increased, but fell back in 2018 as order growth slowed. 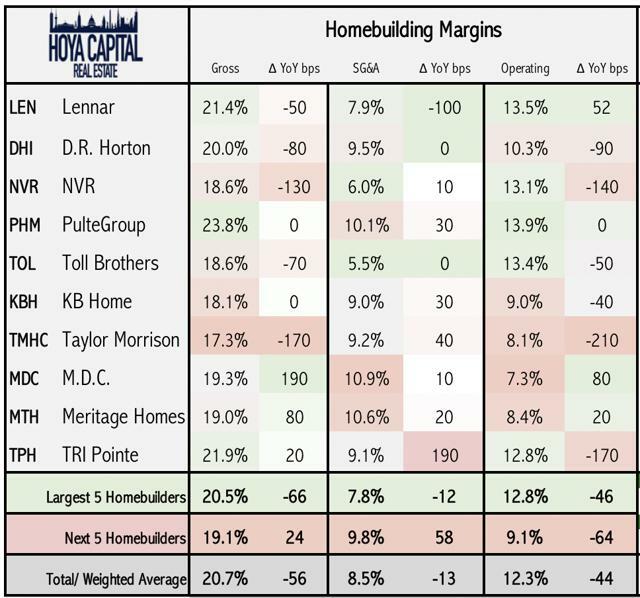 The five largest homebuilders averaged nearly 13% operating margins compared to the 9% margins achieved by the next five largest builders. We continue to note the bifurcation between the larger and smaller homebuilders. Even within our coverage, which only includes the largest ten builders in the country out of a pool of more than 20,000 total single-family builders, the critical importance of scale becomes clear through the wide gap in operating margins, which declines linearly with size. It's reasonable to assume, given the linear trend in the data, that small private builders are having a very difficult time breaking even given these tough economics. As a result, we believe that an increasing share of starts will accrue to the publicly traded homebuilders with the scale necessary to achieve an adequate return. These trends have indeed been borne out in the data. Since the housing crisis, the largest publicly traded builders have accounted for a growing share of total home construction. In 2018, homebuilders accounted for roughly a quarter of all single-family homes built across the US, a rather remarkable feat considering the sheer quantity of single-family homebuilders in the US. 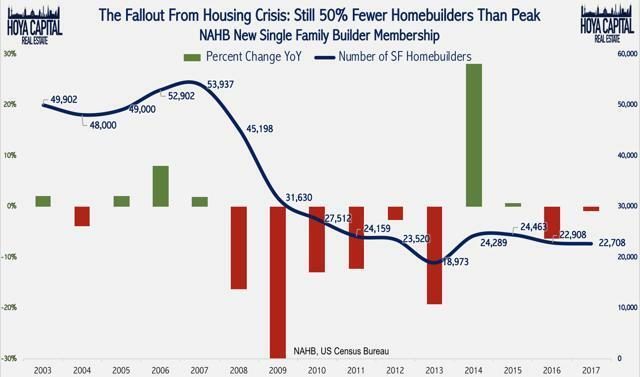 At the peak in 2004, there were nearly 54,000 single-family homebuilders in the NAHB membership ranks. By 2017, those numbers have been more than halved. Access to capital markets (or lack thereof) was the primary reason that the larger builders were able to survive during the housing collapse and thrive in the aftermath while smaller builders went bust. With construction costs rising and largely out of the control of builders, analysts have put increased scrutiny on overhead margins. 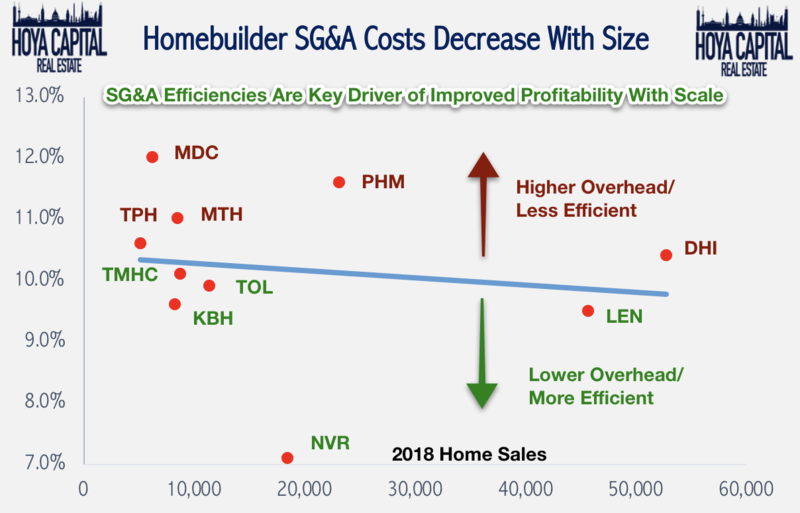 For years, these homebuilders have touted that overhead is a primarily fixed cost that should improve considerably with increased home sales. While SG&A margins have improved modestly in recent quarters, they remain stubbornly high for many builders. 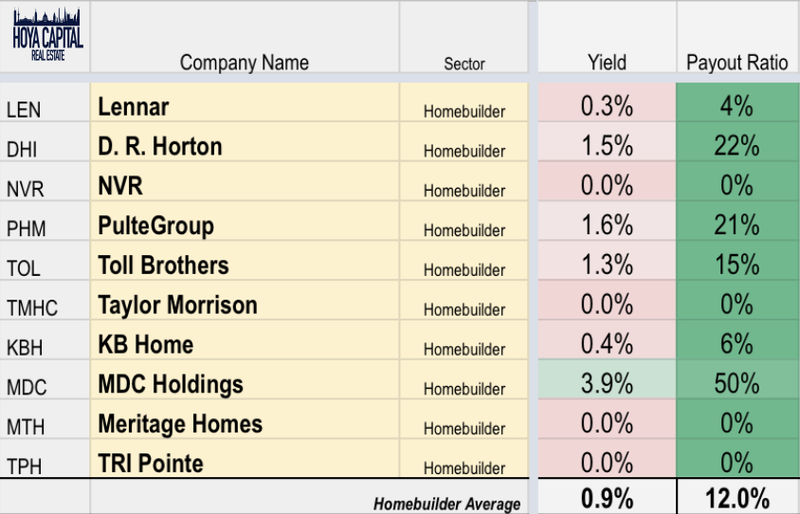 The 2018 selloff in homebuilders pulled down most valuation metrics to their lowest level since the housing crisis. A notoriously cyclical industry, homebuilders have historically traded at discounted valuations to the broader US equity sectors. From 1991 to 2016, homebuilders have traded for an average forward P/E of 10-12x. Even after the recent surge this year, homebuilders still trade at an average 9x forward PE at the lower end of their post-recession range. While REITs are known for their healthy and predictable dividend yields, homebuilders generally pay little or no dividends and instead plow back all of the available cash flow into development. 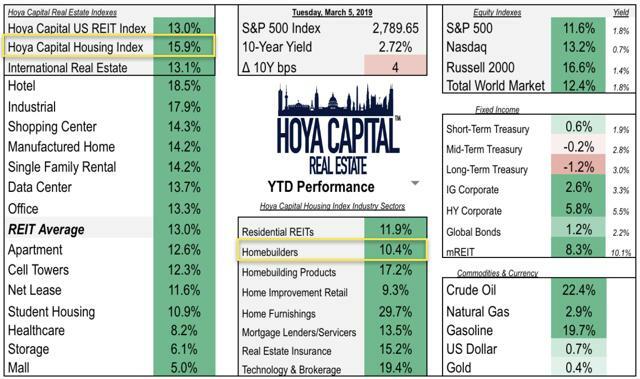 Homebuilders pay a dividend yield below 1%, shy of the nearly 4% yield paid by the average REIT. After their worst year since the financial crisis, homebuilders were left for dead in late 2018. The sector has roared back to life in 2019, powered by receding mortgage rates. Perhaps an echo of 2014, rising rates significantly slowed the single-family markets to near-zero growth in 2018. Back in 2015, housing markets - starts, sales, and prices - all bounced back sharply following the slowdown in 2014. 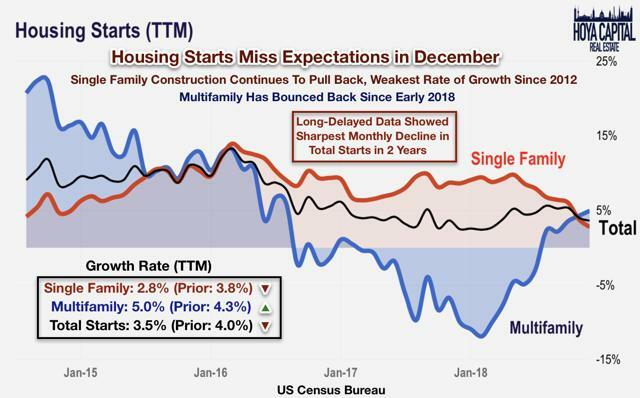 So far, forward-looking indicators of housing data indicate that 2019 may exhibit a similar pattern. The homeownership rate climbed to a four year high in the fourth quarter of 2018 despite continued affordability challenges. Demographics in the 2020s are highly favorable for household formation growth. The ten largest homebuilders accounted for a quarter of all home construction in the US in 2018. Homebuilding economics remain brutally challenging for all but the most operationally efficient builders. By most metrics, the overall US housing markets remain significantly undersupplied, an imbalance that has further widened. Supply growth is the most effective antidote for rising housing costs. Disclosure: I am/we are long XHB. I wrote this article myself, and it expresses my own opinions. I am not receiving compensation for it (other than from Seeking Alpha). I have no business relationship with any company whose stock is mentioned in this article.